The Pet Partner Program is a wonderful opportunity for children to get involved at the shelter in Tremont or the Everyday Adoption Center in Parma. An adult partner must accompany and actively work with/supervise their youth partner in the same volunteer assignment throughout their volunteer experience. Pet Partners may volunteer in most assignments, including those that work with animals. Certain restrictions apply. The first step in joining our volunteer team is to attend a Volunteer Orientation. 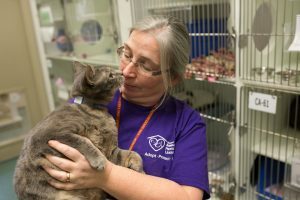 Orientation is a general educational session that will prepare you for volunteer experience at the Cleveland APL. We provide an overview of the Cleveland APL, a chance to learn more about the opportunities we have available, and general guidelines relating to our program. We want a potential volunteer to be educated about the Cleveland APL and have a chance to meet our staff including our President & CEO. Our staff members directly supervise volunteers as our program is decentralized to involve more volunteers well. Orientation is intended to help with advocacy in the future and decisions on how a volunteer’s time is spent at the Cleveland APL. Advance registration is not required; however, seating and parking may be limited with large attendance. Please be prepared to spend no longer than 90-minutes with other animal lovers and staff during this session. Doors will close promptly at 6:00 p.m. for orientation. Those who are not timely or are not able to stay for the entire orientation will be asked to attend another session. The best way to complete a volunteer application is online through our website. Potential volunteers may complete this step either prior to or after volunteer orientation; however, an application is necessary for the next step or interview. An application allows us to create your volunteer file and provides us with a signed release and consent form to complete a criminal background check*. Applications submitted in advance or between orientations are kept on file until you attend orientation. Due to the large volume of applications received, we will not contact you directly upon receipt of your application. *Criminal background check – we do not accept any individuals with offenses relating to convictions including, but not limited to, animal cruelty or neglect, theft, drugs, or violence. An interview simply helps us to match your interests, skills and abilities with our available volunteer opportunities and needs and typically lasts no more than 30 minutes. An interview with the Volunteer Manager or volunteer delegate is a required and necessary step in the process after orientation. During our interview time, we may determine your volunteer assignment(s), your supervisor(s), any necessary training and regular scheduling if applicable. In addition, you will receive necessary on-boarding materials such as our Volunteer Manual. We also photograph our volunteers joining our team for a variety of reasons. After the interview, we also require volunteers working at the main shelter in Tremont to make a $10 refundable security deposit for your access card to the shelter. Volunteer T-shirts are optional and are available for sale for $8, tax-included at our front desk. Volunteers are encouraged to schedule an interview following orientation. Interviews are typically conducted for a period of two to three weeks after orientation and depending on attendance at orientation. A variety of days and times are offered throughout this period of time. Those who are not able to schedule an interview following orientation are encouraged to contact the Volunteer Manager directly; however, there may be a delay in scheduling as there already will be interviews in process. We will do the best that we can with this scheduling, but there are also times when it may be best to postpone your interview after the next orientation for process and training reasons. We provide training to prepare you for your assignment(s) as we want you to be safe and effective in your volunteer role. Our supervisors and/or volunteer coaches conduct department-specific training for your knowledge and safety. Training may be a group session or training on-the-job depending on the assignment. Depending on your volunteer assignment, training may last approximately 60 to 90 minutes. Additional support is provided throughout your volunteer experience by your supervisor and other volunteer coaches. In addition, typically your on-boarding supplies including your volunteer parking pass are available for you to pick up at the front desk during training or your first shift. Since we rely on our volunteers to help us provide excellent service and care to our animals and clients, those assignments will be required to have regular weekly scheduling such as the same day and time each week. Scheduling, maintenance and changes for open volunteer opportunities are completed by you and the supervisor(s) of your assignment(s). Positions that work with animals or clients at the shelter require a regular commitment of at least 2 or more hours per week. In addition, we want to be sure to utilize your time efficiently and effectively. Many volunteers find this helpful as it allows them to build this important time into their schedule or routine. There are some assignments that do not require a regular weekly commitment, but instead, they may be event-driven such as our Offsite Adoptions or Special Events. Again, the supervisor of the assignment will work with you on your schedule for the day, assignment, and preparation or training for the event. Communication builds trust and trust builds a strong team. We strive to keep volunteers informed and updated at the Cleveland APL. A majority of our communication is provided via email. Therefore, volunteers are highly encouraged to have a valid email address that will aid with communication from the Cleveland APL Volunteer Department and from your immediate supervisor. We recognize the need for good reciprocal communication especially when there are changes made when volunteers may not be present. We employ a variety of vehicles to help aid communication; however, the lack of a valid email address may cause communication to suffer. Volunteers will be provided with ongoing communication and support from other volunteers, staff, volunteer coaches, supervisors and the Volunteer Manager throughout your volunteer experience with the Cleveland APL.